VIMED® TELEAMBULANCE offers with special telemedical equipment and completely IT-integrated POC-, laboratory- and diagnostic-systems for an advanced spectrum of acute life-threatening and especially time-sensitive diseases, such as cardiac infarction or stroke. The extensive setting with Point-of-Care diagnostic-systems and the application of telemedical communication / data transmission offer enhanced diagnostic options, allow application of specific medical expertise for diagnosis and thus enable a prompt treatment initiation. The systematic choice of a hospital as well as preliminary information of specialists or the targeted hospital, allow already in advance a medically reasonable and resource-efficient patient management. Additional inter-hospital transfers and their resulting costs can be avoided. Besides possible savings, a faster treatment of the patient can finally lead to a significant improvement of treatment results. The combination of telemedical communication and advanced, patient side emergency diagnostics offers the opportunity for development and / or enhancement of prehospital initiated therapies to a greater extent than the current state. From our point of view, VIMED® TELEAMBULANCE is a concept with future – because of demographic, social and economic factors adjustments and restructurings will be mandatory in the German emergency care. 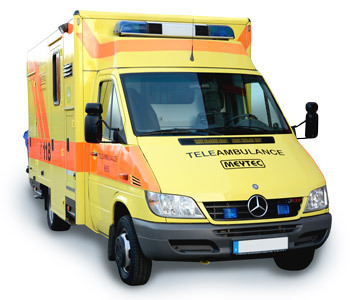 The VIMED® TELEAMBULANCE by MEYTEC presents a possible solution for times of growing resource scarcity and increasing requirements for a faster and reliable emergency care.